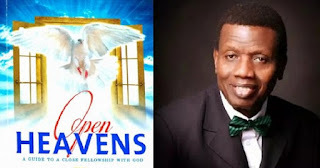 Open Heaven [25 May 2018] Good Neighbourliness I - Open Heavens Daily Devotional Messages, By Pastor E.A Adeboye. This instruction indirectly placed the solution to her problem in the hands of her neighbours, because her ability to get the many empty vessels she needed depended on how good a neighbour she had been. Among the Jewish people in Bible days, loans were not supposed to be commercial in nature; rather, they were to be given on charitable terms. For example, interest-free loans would be given to assist a peasant farmer during a period of poverty. The primary motivation of borrowers was to obtain relief from need rather than to further their economic enterprises. For this reason, lending with interest to the poor was prohibited in Exodus 22:25. God’s expectation is that leading to the poor will be a form of sacrifice motivated by the spirit of mercy and compassion in obedience to Him (Proverbs 3:27-28). Although the Bible encourages us not to go on their behalf based on factors such as good neighbourliness. In Acts 9:36-41, the neighbours of Tabitha protested vehemently against her death and pleaded with Him, saying this man deserved His assistance because he had shown his love for them by building them a synagogue. Without controversy, good neighbourliness played a very big role in these cases we have considered. In the case of the widow in 2nd Kings 4:1-6, the fact that she went to her neighbours and got the vessels she needed indicates that she had been a good neighbour to them. Imagine if she was the kind of person who was not known to her neighbours or if she was a proud and difficult person; she would have been denied the vessels she needed and her miracle would have been a mirage. God charged us in Romans 12:18 to live peacefully with all men, knowing fully well that apart from it being a source of blessing to us, a peaceful coexistence with our neighbours will give us the much needed opportunity to preach the good news to them. Make peace with every neighbour you are not at peace with.